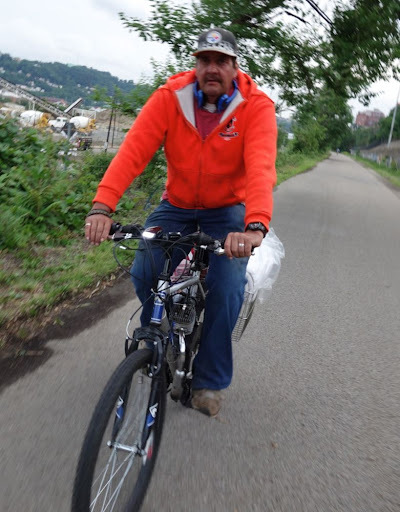 I saw this guy, Thursday at 8pm, cruising along without pedaling at about 15mph on the Eliza Furnace Trail from Grant St to the Hot Metal Bridge on a motorcycle with pedals (or bicycle with gasoline engine). His exhaust was stinking up the trail for the rest of us. I pedaled fast, caught up to him, and asked him “Did you know that motorcycles aren’t allowed on this trail?” He acted surprised, stopped, and perhaps turned around. Stinking it up worse than 376 running next to it? Would it have been ok if it was electric? Or if he was pedaling and not using the engine? I’m torn about how I feel. I’ve seen human power going faster than 15mph, so it didn’t sound like he was recklessly careening around people and bikes at excessive speed. I probably would shrug and ride on in that situation. People should know they aren’t supposed to be using the trails with motorbikes, moped, etc. I think Paul did the right thing. It sounds like the guy just didn’t know. I’ve seen quite a few of these lately. Personally, I don’t I like them, but I don’t think they are going to cause the world to implode either. My main hang-up is that a bicycle with an engine going 20mph has to be way more dangerous than driving a small scooter at 20mph due to tire & brake size, etc. So I wish the people driving these things would just go out and buy a small 50cc scooter that would handle better and be safer. As for riding these things on dedicated bike/pedestrian trails; as long as they do so in a safe way (i.e. the speed of the rest of the trail users), I guess I wouldn’t get too worked up about it. So where do electric bikes fit into this equation? They can certainly go as fast. It seems like an innocent mistake made by not connecting the dots. I wouldn’t want to smell burning gas from a small engine either. Electric would be better in this scenario… but the second a path gets clogged up with electric vehicles that don’t want to use the proper roads that opinion won’t hold up. He could be taking the “scenic route” but odds are it’s a dis-comfort riding on the road thing. If I’m wrong, then nevermind… but if I’m correct, then he is just one more potential ally for better infrastructure and we should be careful not to alienate such a person while still making a point that it doesn’t belong on the trail. I don’t like the idea of any cycle with a motor on the trails. I can’t stand those two stroke motors that do indeed stink and are not even available for lawn mowers because they pollute so much. Hope that doesn’t become some trend. I don’t have a problem with electric bikes on trails. Not so noisy, etc. But most of the people using them should just HTFU. Does that mean that even though it’s technically a bike (with that law) it has a motor which is not allowed on the trail so therefore it can’t be on it? His gasoline engine was indeed stinking up the trail worse than the adjacent freeway. The people trying out those electric assist bikes look like they are having the best day ever. “Motorcycle” in pa is above 50cc… this dude is not that. the end of the jailtrail. Complaining about pollution during rush hour on the jail trail is futile. of other cars idling 5 feet over? somebody rolling solo in a car. Two stroke engines do dump a bunch of gas into the air. I can easily imagine one of them being smellier than a lot of cars some distance away with four stroke engines and catalytic converters. Coming up Greenfield Ave can also be a bit intimidating because the uphill lane is fairly narrow and has no shoulder. I’ve thought about an electric assist bicycle for my wife. Plenty of downsides to the idea, weight, cost, less exercise, lack of multi-mode ability. Also had my doubts about whether they were allowed on trails (or should be). But if they are, maybe it is something she’d be more receptive to than having to huff it without an assist, and any trips in the jeep grand cherokee that get replaced become big money saver, gas, maintenance, and parking wise. Does anyone have any experience with these? Granted, quite possibly is just the best day ever but any actual experience reports probably tell a little more than a marketing photo. I am fully against any gas powered vehicles on the trails. I like to see more and more bikes, but not ones with stupid motors on them. Two cycle motors are horrible and stink. I don’t think we need that crap on the trails. Electric? I guess, but I don’t get it. Just get a bike with gears and take your time. Tehre was a guy caross the street from the had a gas motor assited bicycle. I live at Parkview Ave just north of the Blvd of the Allies. This bike was SO LOUD that , when he went down over the Swinburn St Bridge, I could hear whether he went right or left at Geenfield. I’ve also seen electric bikes cruising down the sidewalk and around corners at maybe 15 mph. @byogman, I don’t have any experience with these things at all, but I think there are two styles of electric bikes; one where you can just hit a button and go, and some that are truly an assist and only kick in if you are turning the pedals. The stretch between Duck Hollow and the Rankin Bridge (which, I think, is the bit that you’re talking about) is free territory. Anything goes. Until the people responsible for such things get around to aligning a bike trail, it’s ok for anyone to do whatever they want (except, I guess, visiting the steel mill). But you know, I kind of like that stretch. It’s one of the more fascinating bits of Pittsburgh. helen s wrote:So where do electric bikes fit into this equation? They can certainly go as fast. It depends. I know one owner of self made electric bike and his bike is capable to go 55 mph pretty easily and for a long time. Bike just has enough LiPo batteries on it and something like 850 Watts motor. Not sure what my reaction would be to the original situation, I’d have to experience it. If the thing was properly muffled and the guy wasn’t flying and acting like a douchebag, I probably wouldn’t bat an eye. Since I started biking and using the bus seriously in about ’08, I have halved my personal car use, probably 20% family-wide (my wife drives a shitload, and that’s never changing. She is a more typical American). If I got an electric assist cargo bike I could probably halve it again, and I used to dismiss elec assist. I was riding into town one day and right during my regular life-threatening traverse of the West End Circle/W Carson Street passage, a guy silently wafted down W Carson on an assist cargo bike right in traffic, about 20-25 mph, like angels were pushing him. It was lovely. @mikhail: LiPo = Lithium + Polonium. This is in Russia, right? (I hope). Lithium polymer, I think you’ll find. Polonium is usually restricted to space probes, laboratory experiments, and seasoned salt FOR MEN. jonawebb wrote:@mikhail: LiPo = Lithium + Polonium. This is in Russia, right? (I hope). :( *edit* nevermind… this website doesn’t like cyrillic. Then after work, I rode behind a Venture Outdoors pickup truck driving on the northside trail from around the kayak rental out to the far edge of the houses. they may have been transporting goods to the rental location, but were still driving on the trail. There was a big overnight op on the hillside over the parkway, they had cops all over the hillside and helicopters hovering around. Probably related? EMT’s on motorcycles were headed East on Jail Trail this morning. I don’t see a problem with it. I saw a guy who parked his car under one of these pillars to go fishing yesterday. He must’ve come off the highway, drove onto the trail, squeezed thru a section next to the river not much wider than his car. Lou M. wrote:EMT’s on motorcycles were headed East on Jail Trail this morning. I don’t see a problem with it. I saw them before and I DO have a problem with it. WTF, we only have a little bit of trail around here. Get the crap off the damn trails. Goodness, can’t cyclists and joggers have a little spot of the f’n city? NO, I DON’T want them on there period! Forget about our space vs. theirs, it’s just dumb. Is there any reason to think they weren’t heading to an emergency on the trail? I agree that they shouldn’t be using it just to get from A to B quicker.